It’s no secret that our PR team are a bunch of foodies, so when The Ivy Collection approached us to arrange and manage the launch of its new restaurant in the Victoria Quarter in Leeds, we jumped at the chance! 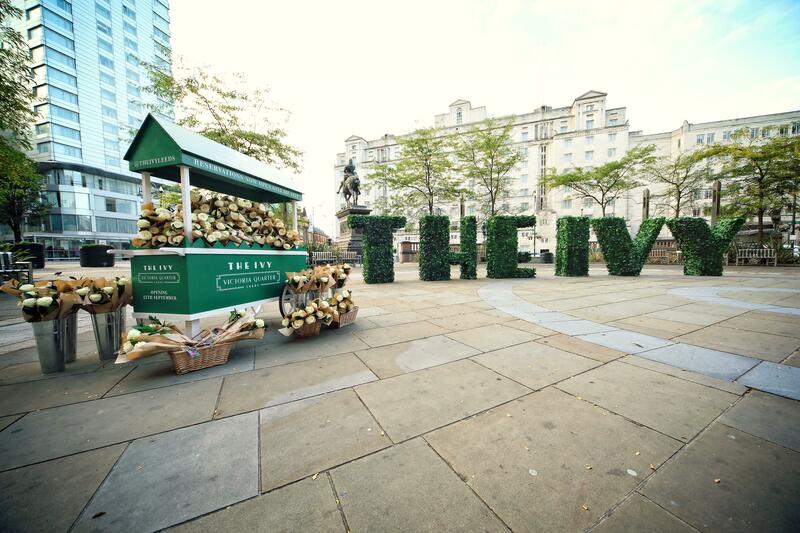 Working closely with The Ivy Collection team to facilitate the launch of the new eatery, our events specialists utilised their expertise to roll-out a pre-launch stunt in Leeds city centre, specifically targeting consumers in the city to effectively drive reservations at the new restaurant. 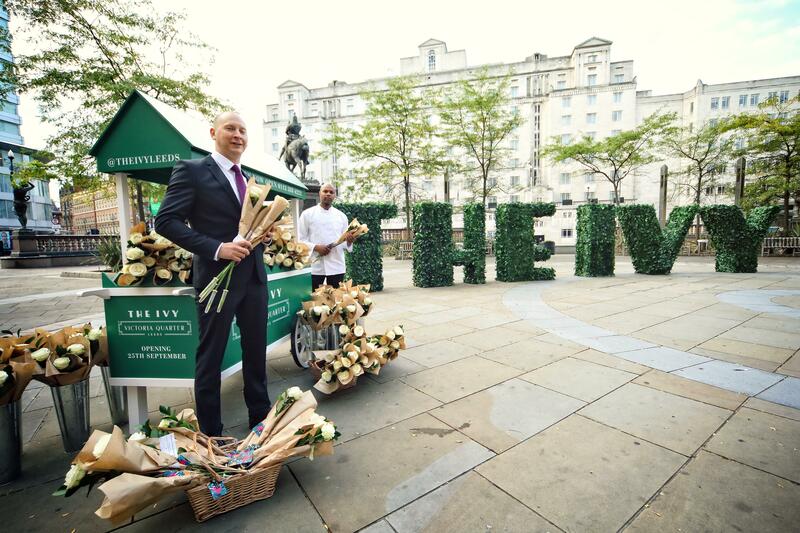 Erecting a two-metre-high ‘living’ sign spelling out ‘The Ivy’ in City Square – one of Leeds’ busiest commuter areas – we handed out more than 3,000 white Yorkshire roses to passers-by, each of which had the booking details for the restaurant tied to its stem. We also handed out roses in other high footfall areas, including the Victoria Quarter and Albion Street, from specially-made flower carts featuring The Ivy branding. 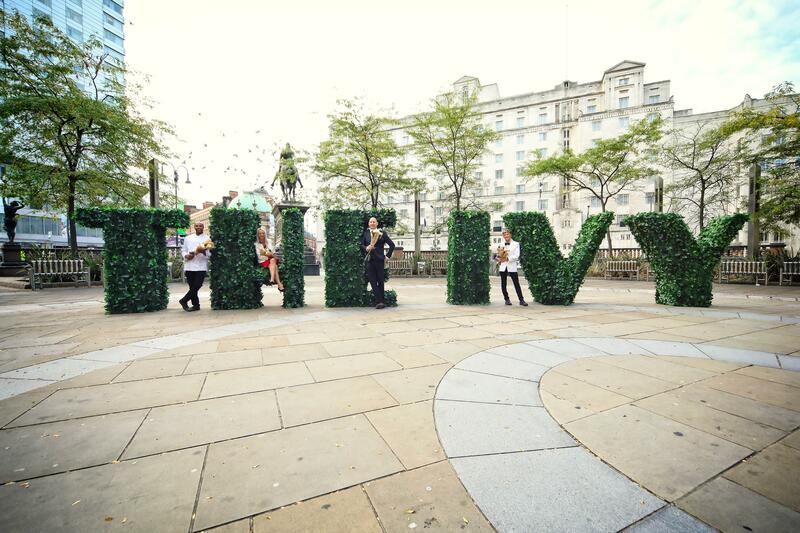 From constructing the ‘living’ Ivy sign and installing all elements of the activity in Leeds city centre to managing the event on the day and organising the full derig of the activity, our events management team coordinated the entire stunt from start to finish. Our videographers were on-hand to capture footage of the flowers being handed out to consumers, which was then shared across The Ivy Victoria Quarter’s social media channels. As well as organising the stunt, our PR team rolled out a targeted, pre-launch media relations campaign for The Ivy Victoria Quarter. We arranged a partnership with one of Leeds’ widest-read online outlets, Leeds-List.com, to run a series of exclusive content in the lead-up to the restaurant’s launch. This included a competition for one lucky entrant to win a table for four at the restaurant, the exclusive announcement of the restaurant’s opening date and a first-look sneak peek at the interior décor of the eatery. Interviews with the restaurant’s general manager at the ‘living’ sign were arranged on the day the reservations line launched, with publications including Leeds Live and Leeds-List.com coming along to speak to the general manager about the restaurant’s offering. Press releases announcing the launch date for the restaurant’s reservations line, the eatery’s opening date and the launch of the booking lines were issued to key local and regional media outlets, as well as imagery of the ‘living’ sign installation captured by our photography team. In addition, the team secured a number of exclusive features with key lifestyle publications across the region ahead of the restaurant’s launch. These include Yorkshire Living’s interview with Executive Chef, Sean Burbidge and an exclusive interview between TheBusinessDesk.com and Director of Operations, Baton Berisha. The campaign implemented by our PR team generated more pre-launch reservations than targeted and the activity resulted in unprecedented media coverage across the region – 169 cuttings were secured following this activity, with a reach of more than 19 million across print, broadcast, online and social media platforms.